For some weeks Homer worked off farm this winter. During that time the laying hens were kept in a larger area, with electric fencing..that worked..some of the time..
As the weather warmed we lost more laying hens than we wanted to. We want our losses to be zero, but the hawks, owls and probably fox had different ideas. 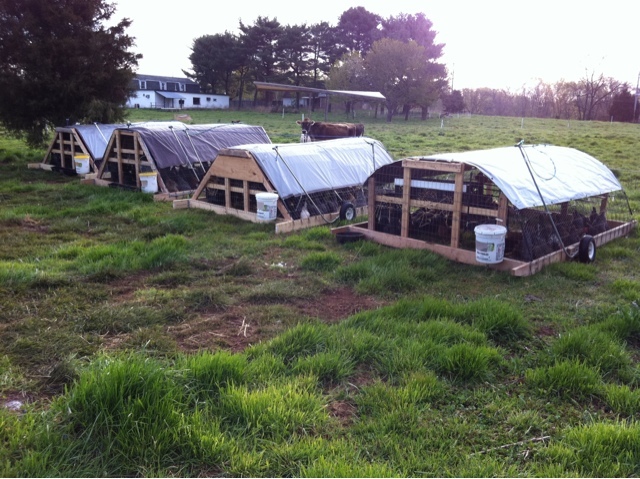 Work was done upon Homer's return to the farm to get additional pens ready, and to move all the laying hens in them. There are about 100 more egglayers, teeny, tiny size, in the brooder right now. We will need 2 more pens for them in the next few weeks, at about the same time that turkeys move onto the field and chickens as well. Busy times, and we still need more cattle to mow the grass, our herd is already not keeping up. And we need little piglets for cleaning between rows. More seeds in today, as vegetable distribution begins in 4 weeks or so..